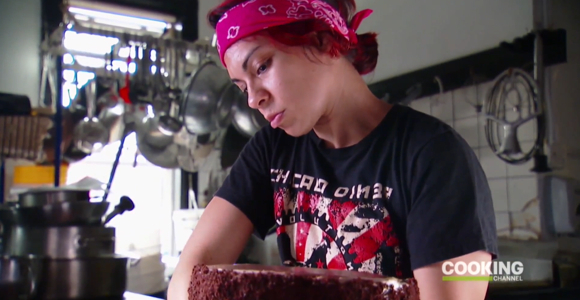 Melissa Sabaduquia, bakery manager at The Chicago Diner, makes a vegan cake. The Chicago Diner and the restaurant/bakery’s Chocolate Mousse Layer Cake was spotlighted last fall on Cooking Channel’s Unique Sweets television show. Check out the complete segment in the video below. The Chicago Dinner has been a longtime hangout for vegans in Chicago. “Meat free since ’83” and often packed, try out their dishes for yourself at their original location is at 3411 North Halsted Street in Lakeview. A second location is located at 2333 North Milwaukee Avenue in Logan Square.